A local state representative is fighting to keep the doors open at two local schools in wake of the state budget being passed earlier this month. The Illinois General Assembly passed a state budget several weeks ago, marking the second straight year that the state has had a budget after more than two years without one prior to last summer. State Representative C.D. Davidsmeyer, of Jacksonville, joined WLDS’ “What’s On Your Mind” program last week. Davidsmeyer did not vote in favor of the state budget, and says there are still of number of issues that need to be resolved at the Capitol. Davidsmeyer goes over his main contention with the state budget as it was presented and eventually passed, and ultimately why he decided to vote against it. “I talked to the budgeteers and the people who were negotiating and I said, ‘At the end of the day, a lot of people made a tough decision last year to make sure that we had a budget. It involved a tax increase and a number of other things that people didn’t like – probably one of the toughest votes a politician can take, and now they have all this extra money and they’re not paying down any of the old stack of bills. It just doesn’t make sense – when you have this influx of money, that’s when you have to make sure that you’re taking care of past liabilities,” says Davidsmeyer. As for why a number of state lawmakers supported the budget, Davidsmeyer explains how this new spending plan deals with paying off pensions. “Back pay that we’ve been talking about forever for state employees… Former Governor Quinn promised a raise, but the general assembly didn’t put the money in the budget to pay that raise. The courts ordered that that be paid, and it’s been hanging out there since 2011. We’ve made advances toward making the full pension payment. My concern is that this one does not make a full pension payment, but we’re getting closer. There’s changes allowing the state to buy out pensions. Let’s say someone worked for the state for 10 years. They’re fully vested, but they don’t want to wait until retirement to receive that money. The state will look at the value of what their pension would be at retirement, as well as life expectancy, and pay them 60% of that value today in a qualified retirement account,” explains Davidsmeyer. Davidsmeyer says that he was assured by the Illinois Department of Human Services that ISD and ISVI would be properly funded over the course of this spending plan. “On the house floor, when we were doing the budget debate,that was one thing that I specifically asked. I said, ‘Are the Illinois School for the Visually Impaired and Illinois School for the Deaf fully funded in this budget?’ and I was assured that yes, they are. I said, ‘So we’re not talking about any closures?’ and they specifically said that they were not talking about any state closures. I spoke with the head of the Department of Human Services on the day of the budget vote, and they said that they are taking cuts to their operational line items, but we will make sure that Illinois School for the Visually Impaired and Illinois School for the Deaf can continue to operate the way that they have been,” Davidsmeyer says. 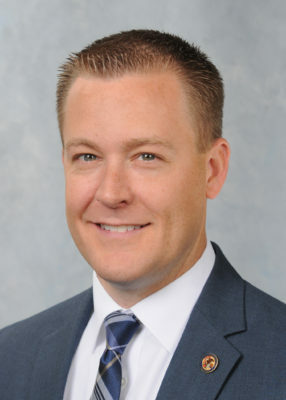 To hear more from the Representative of Illinois’ 100th House District, check out our entire interview with Davidsmeyer online at WLDS or WEAI.com.